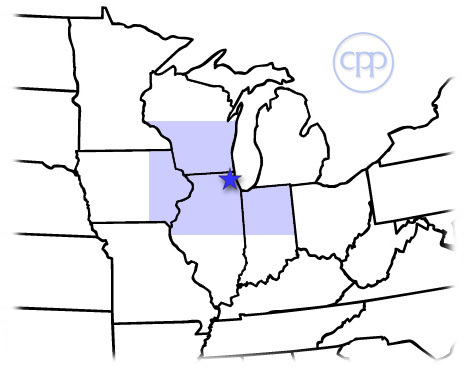 Sales Territory - Chicago Power & Process, Inc.
Wisconsin: the counties east and south of, and including, Vilas, Oneida, Lincoln, Marathon, Wood, Juneau, Monroe, LaCrosse, Vernon, Crawford and Grant. Illinois: Counties north of, and including Henderson, Warren, Knox, Peoria, Woodford, Livingston, Ford and Iroquois. Indiana: counties north of, and including, Warren, Fountain, Montgomery, Boone, Hamilton, Madison, Henry and Randolph. Iowa: the northeastern area bordered by and including the counties of Mitchell, Floyd, Butler, Grundy, Tama, Poweshiek, Iowa, Johnson, Cedar and Scott.